The CD158b1, CD158b2 and CD158 j molecules are monomeric integral membrane glycoproteins existing in different forms. CD158b1 and CD158b2 (p58.2 and p58.3, respectively) are 58 kDa molecules. CD158j (p50.2) is a 50 kDa molecule. All three have identical extracellular portions, but different transmembrane and cytoplasmic regions. CD158b1 and CD158b2 likely represent allelic forms of the same locus. There is another comprehensive nomenclature which refers to these molecules as KIR2DL2 for CD158b1 (p58.2), KIR2DL3 for CD158b2 (p58.3), and KIR2DS2 for CD158j; these acronyms stand for Killer cell Immunoglobulin (Ig)-like Receptor (KIR), with extracellular part containing 2 Ig Domains (2D), and cytoplasmic tails being either long (L) or short (S). The long intracellular portion of CD158b1/b2 (p58.2/p58.3) makes them inhibitory forms, since they contain two characteristic ITIM motifs (Immunoreceptor Tyrosine-based Inhibition Motif) and are involved in the transduction of an inhibitory signal through the activation of the protein tyrosine phosphatases SHP-1 and/or SHP-2. The stimulatory form CD158h (p50.1) lacks these ITIM motifs. CD158b1/b2 (p58.2/p58.3) function as inhibitory receptors for a group of HLA-C molecules (Cw1, Cw3, Cw7 and Cw8 supertypes). The inhibitory effect is dominant over the activation exerted by the activator form p50.2. The CD158b1/b2 and CD158j molecules are indistinguishable from the extracellular viewpoint. 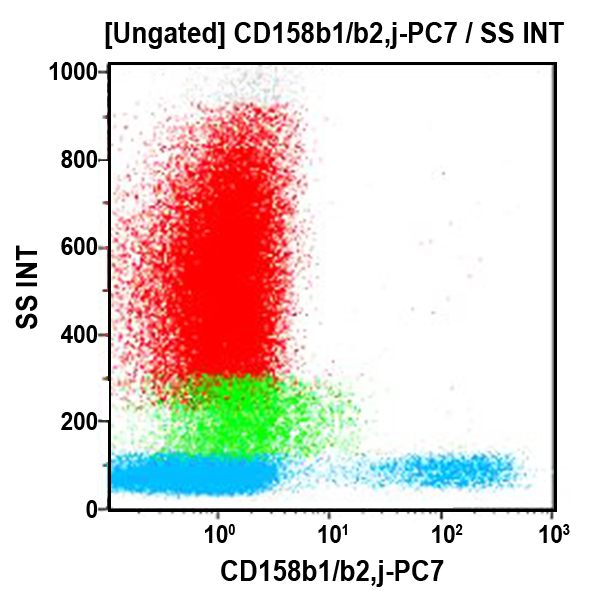 They are expressed by a subset of NK cells, and can be detected on the surface of sub-populations of peripheral T lymphocytes, mostly of CD8+ phenotype. Clone Description The GL183 antibody reacts with both p58.2/p58.3 and p50.2. The antibody restores the ability of p58.2+ NK clones to lyse targets expressing HLA-C molecules.